Arno A. Evers FAIR-PR was founded in 1990 in Munich, Germany. Arno is also the founder of the Group Exhibit Hydrogen + Fuel Cells at the annual HANNOVER FAIR since 1995. 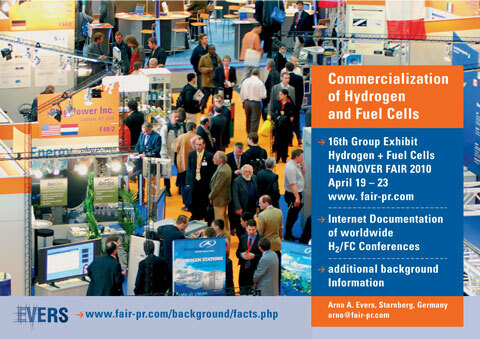 This Group Exhibit Hydrogen + Fuel Cells has grown each year to become the most international commercial trade show and one of the largest, serving the H2/FC global industry. After twelve successful Group Exhibits on Hydrogen + Fuel Cells at the annual HANNOVER FAIR, Arno decided to give his “ownership” to the Deutsche Messe AG, who is the owner of the worldwide biggest fairground in Hannover, Germany. The operational upkeep of the proven “Full Service Package” for exhibitors, forum participants, visitors, politicians and the media alike will be maintained by Tobias Renz FAIR-PR and his team. Arno A. Evers started his career in 1965 with a British oil exploration company in the Persian/Arabic gulf, later joining the German aircraft industry. Here Arno was involved from 1969 through 1985 in implementing the European Airbus Program (A300 - A380) into the international market from their Hamburg plant. Arno’s last position was Deputy Spokesman at Munich-based Messerschmitt-Boelkow-Blohm GmbH (MBB, now part of Daimler AG) where he served 23 years before starting his own company, Arno A. Evers FAIR-PR. His firm has taken on the job of explaining highly complex issues to the public and the media at leading trade fairs like CeBIT and the annual HANNOVER FAIR. Arno is now promoting the Group Exhibit Hydrogen + Fuel Cells worldwide, attending between 12 to 15 international energy conferences annually at the period 2006 through 2010. Here he acts as speaker and/or poster presenter. His company is documenting all these activities online. 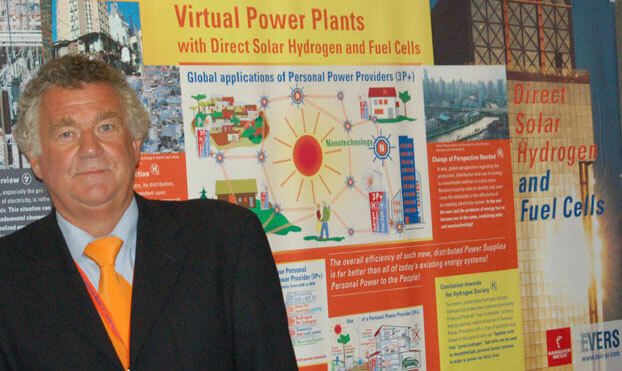 Arno A. Evers FAIR-PR is also the provider of a biweekly newsletter and hundreds of online Energy Images, Information graphics featuring the future of our worldwide energy supply.